Chess is a game of the mind, which can only be won by out-thinking your opponent. But intelligence is never enough as rigorous training is the only way to make oneself a better player. Even legends like Vishy Anand or Magnus Carlsen devote hours daily to improve. Here are 5 strategies that will help you perform better at chess. Managing one's time is a key factor in chess and players, who wish to take up the game seriously, need to be aware of how they manage time. Time must be set aside for the more important moves which will come as the game progresses to later stages. A key strategy to improve your game of chess is to take an early positional advantage over the opponent. Players must try to protect their strong pieces and create impenetrable structures around the King. Castling is always a great move in this regard. However, positions should be structured in a way that pieces are able to move and movements do not get unnecessarily blocked. The center of the board is where the major action happens, and the players, who usually controls the center, tend to win the match. A player's strategy should always be to dominate the center by taking up key positions, which will make attacking easier without taking risks. The four squares at the center are vital and thus deserve special attention. One should always keep in mind that chess games are not won by defending alone. Risks need to be taken, and attacking is a key factor. Attacking will force the opponent to change positions and will also mentally weaken them in anticipation. And once the opponent's positional setup is disrupted, there is almost no chance of making amends. 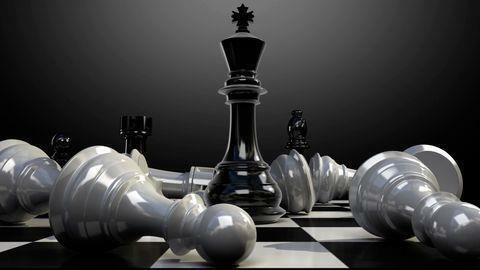 Pawns are vital pieces on a chessboard and players should keep in mind not to lose them early. They help in constructing strong positional structures and creating defenses. Pawns will also help one in the final stages of the game if the opponent's defenses are weak. Players should try and identify where the weaker pawn structures are in the opponent's pieces and attack accordingly.